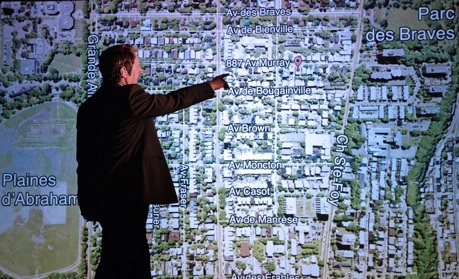 Robert Lepage’s latest theatre piece, 887, now having its world premiere during Panamania, is an intensely autobiographical work about Lepage’s childhood in Quebec City. The title is the number of the apartment building his family lived in on Avenue Murray. After a number of grandiose spectacles in the recent past, it is good to see Lepage present such personal subject matter on such a relatively small scale, though it still integrates all aspects of theatre arts as have his past works. Since it is a memoire Lepage feels the need to expand his subject to cover memory in general, though that element is less consistent and less successful than the personal life history at the core of his narrative. In a direct address to the audience Lepage tells us that the idea of the play came from his being asked to recite the seminal poem “Speak White” by Michèle Lalonde at the 40th anniversary of the Nuit de Poésie in Montreal. He found the poem written in the automatiste style of the time extremely difficult to memorize. This, in turn, caused him to wonder why he can still remember his old phone number at 887 av. Murray, but not his current phone number. He speculates whether having such devices as smartphones to hand has actually reduced our ability at memorization. He mentions that someone suggested he try the ancient technique of memorizing known as the palace of memory attributed to Simonides of Ceos (c. 556-468bc). In that technique, still used today, a person associates parts of what he has to memorize with different places inside a room or building thereby giving the text to be memorized a visual dimension. 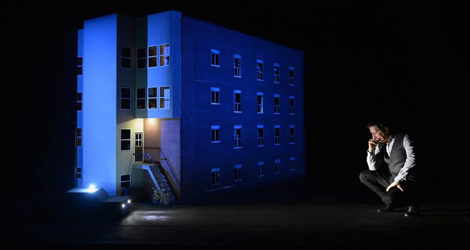 At this point we are introduced to what will be the principal set of the play – a wonderfully detailed eight-foot-high scale model of the four-storey apartment building at 887 Av. Murray. Lepage begins with his family’s apartment on the third floor, the front room lighting up when he mentions it. So it is with the seven other apartments that not only light up but have videos playing inside to illustrate the activities Lepage describes. Lepage’s extensive knowledge of his neighbours’ backgrounds expressed with mordant humour towards some and sympathy for others makes him sound much more like Michel Tremblay than Robert Lepage. While the palace of memory technique is of no use to Lepage in memorizing “Speak White”, this scale model becomes a literal palace of memory for Lepage in narrating his own biography. The model apartment building also is the latest in Lepage’s concept of the set as magic box, as in Jeu de cartes: Pique (2012), where a single compact object contains within itself a large number of sets representing other locations. The set for 887 is not as obsessively compact as the four-foot-high disc in Jeu de cartes: Pique. It is situated on a revolve so that when two sides of the apartment are shown to the audience, the back of the set can be dismantled and loaded for the next scene. Thus, the apartment building can be turned into two rooms in Lepage’s present apartment – his library and his kitchen. These scenes in the present involve Lepage’s comic attempts to get a friend of his, Fred (whom we never see) to help him memorize the poem. Since Fred once worked for Radio Canada, Lepage becomes curious about their “cold cuts” or the obituaries they have stored up on living people ready to use when a person dies. Specifically, Lepage would like Fred to retrieve a copy of the cold cut on him. In this way, Lepage expands the notion of memory from memorizing a poem, to remembering his childhood to wondering how he will be remembered. The truth, of course, is that the living have no control over how they will be remembered. This line of thinking leads Lepage to recall how streets in Quebec City, once named after heroes of the Plains of Abraham have been renamed after people forget the story behind the original names. Commemorative monuments like a column celebrating the British victory in Quebec or of Queen Victoria are toppled or blown up. A clip from a documentary about the Château Frontenac shows what high tea was like in the 1960s, illustrating without commentary an entire mode of attitudes in culture, fashion and etiquette that has disappeared. Lepage’s childhood also covered the rise of the FLQ and the October Crisis. He notes that in Quebec City the kidnapping of James Richard Cross was overshadowed by the hunt for a local serial killer. Yet, he recalls the evening of October 8, 1970, when everyone sat in front of their television sets when Radio Canada acceded to the FLQ demand that its entire manifesto be broadcast. As it happened that evening Lepage’s paternal grandmother who had been suffering from Alzheimer’s disease, died, and Lepage’s father, not wanting to show his emotion, left the room to sit in the taxi he drove for a living. As an autobiographical play, 887 is highly theatrical and filled with a series of beautifully composed images. The play mentions a host of topics related to memory – memorization of a text, mental reconstruction of the past, destruction of commemorative monuments, renaming streets, loss of memory due to disease – but the text never binds these topics into a coherent whole. Lepage, otherwise so aware of the metatheatrical aspects of his work, never points out the inherent irony of his play. The starting point is his supposed inability to memorize a poem three pages long, yet Lepage is obviously capable of memorizing the text for a solo play that is two hours long. Either the premise is disingenuous or Lepage had a difficulty in memorizing “Speak White” that has nothing to do with memory itself. Lepage seems to hint at this when he says he would have to reorganize his entire library to accommodate a copy of the poem. He does, eventually, deliver a powerful recitation of “Speak White”. Some scenes may be beautiful or humorous but serve no particular purpose. There is an elaborate set-up for a scene of Lepage’s father sitting alone in a diner. Nothing happens and we have no clue how this relates to his story. Another scene has Lepage put a video camera on a model Lincoln Continental and show us the scale model people lined up on the street to greet Charles de Gaulle. He drives us past the people slowly, then goes past backwards and then speeds ahead again. It’s fun but serves no particular purpose in moving the story forward. Other scenes try in vain to connect Lepage’s memories of Quebec with the larger theme of memory itself. In a visually stunning sequence, a video of fireworks over the Plains of Abraham morphs into an animated illustration of synapses firing in the brain. The connection between the two images fails because any active brain has synapses firing, not just ones creating memories. Later, Lepage tries to illustrate the difference between the left and right sides of the brain by comparing the orderly life in his family’s apartment (on the left) to that of the continually fighting family next door (on the right). The animation of the the members of both families is amusing but since members from one side enter the other, the analogy, already weak to begin with, quickly breaks down. 887 is most effective as a chronicle of a childhood lived in Quebec City in the turbulent period of the late Sixties and early Seventies. Through the thorough knowledge of his characters and the intertwining of their lives and historical events, this is the first Lepage play that feels like a direct descendant of the world of Michel Tremblay. If we ignore Lepage’s desultory attempts to expand his theme to cover memory itself, the play demonstrates that any individual life, not just his own, is a product and a chronicle of its time. Photos: (from top) Robert Lepage in 887; Robert Lepage in 887; Robert Lepage in 887. ©2015 Eric Labbé.